BMW X5 Front Seat Support & Comfort Pros and Cons | Page 1 of 1 | Why Not This Car? What drives people to buy (or not buy) a certain car? 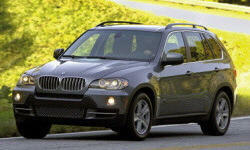 TrueDelta's members share BMW X5 pros and cons based on their real-world driving experiences. We loved the seating and overall room. This was a favortie car for road trips to the mountains or wherever. BMW's multicontour seats, a $1,300 option on six-cylinder X5s and standard with the V8, deliver a rarely matched combination of support in turns and comfort on long drives. In a reversal of traditional tendencies, the buckets in the Range Rover Sport feel firmer and less comfortable.